If you cut the chicken into smaller pieces before breading, they’re nuggets—the guilt-free kind. Place flour in a shallow bowl. Beat eggs in a second shallow bowl. Combine panko, Parmesan, and mustard powder and oil in a third shallow bowl and season mixture with salt and pepper. Season chicken with salt and pepper, then dredge in flour, shaking off any excess. Transfer to bowl with beaten egg and turn to coat. Lift from bowl, allowing excess to drip back into bowl. Coat with panko mixture, pressing to adhere. DO AHEAD: Chicken can be breaded 3 months in advance. Place between pieces of freezer paper or waxed paper and freeze in resealable freezer bags. Thaw before continuing. Cook in Airfryer at 180° for 30 minutes or until golden brown and cooked all the way through. Season with salt. Serve with lemon. 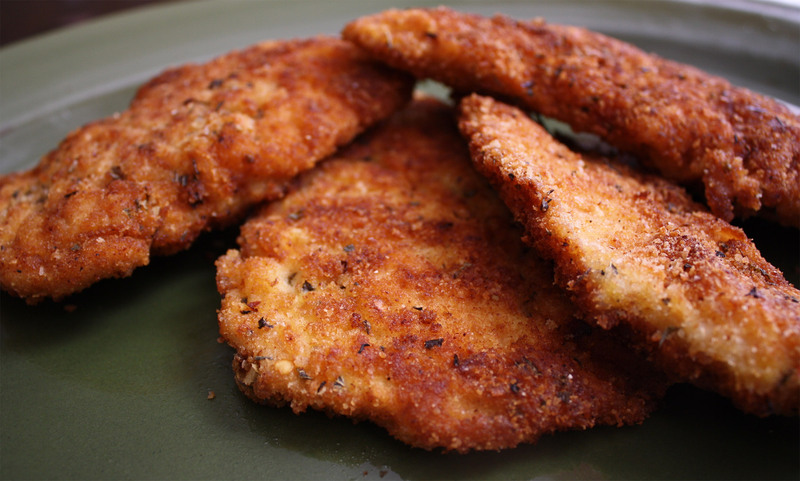 How long do I cook 6 breaded chicken cutlets in the air fryer. Do I have to spritz them or just place in the basket? Does the breaded recipies work with Gluten free Four?